Under the sea mermaid baby shower invitation with storybook style illustration. 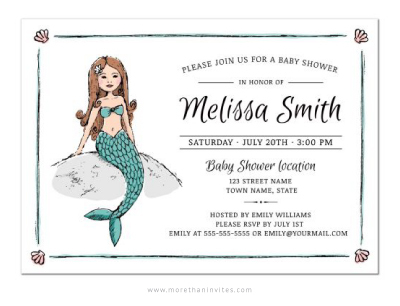 This mermaid baby shower invitation features an illustration of a mermaid sitting on a rock and has an aqua blue border with clamshell seashells in the corners. This mermaid baby shower invitation is turquoise, peach, and white in color and is perfect for baby showers with a mermaid theme or for an under the sea theme. The layout of the wording is whimsical and fun and the design has an overall feel of a children’s storybook. Works well for baby showers for a girl baby.